Nima Fakhrara's score for the video game 1979 Revolution: Black Friday contains 21 tracks (48 min, 02 sec). I have to admit that I didn't really find much to enjoy here. Fakhrara's attention to detail and his work ethic of going much further than the original brief requires, makes me feel very guilty for not enjoying this more. Because of the game's location and place in time, period-accurate recording techniques (including microphones, compressors and tape machines) and analog synths were employed. In addition Fakhrara tried, wherever possible, to replace western instruments with an Iranian alternative from the same family. In fact, he was such a perfectionist when it came to getting the sound as authentic as possible, that he insisted on only using Iranian instruments,, not arabic, greek, Armenian, or any other countries. This is how important attention to detail is to Fakhrara. However, as technically astounding as this score is, I couldn't help feeling that it missed having a heart. I'm a soundtrack collector who gets a rush from scores that gives you an emotional response when listened to outside of the project it was created for. While I understand that atmospheric soundtracks that are packed with music cues rather than themes are designed for their individual projects, I don't really understand why they are released as standalone albums. 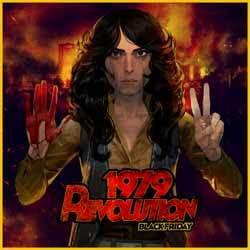 1979 Revolution: Black Friday is an interesting and flawless collection of atmospheric set pieces, but it doesn't lend itself to being listened to while you're out for a drive, or put on in the background while you doing something creative.